Evening primrose oil and fish oil both contain essential fatty acids. This means that your body cannot make them on its own and must get them from food and/or supplements. These fatty acids have been studied for a wide range of purposes and research indicates they might offer benefits for a wide range of conditions, though not all purported uses have stood up to scientific investigation. Fish oil contains rich stores of omega-3 fatty acids such as DHA and EPA. These fatty acids are best known for their ability to reduce inflammation. Evening primrose oil contains omega-6 fatty acids. While some omega-6 fatty acids have been known to cause inflammation, the fatty acid present in evening primrose oil -- gamma linolenic acid -- has been shown to reduce inflammation. 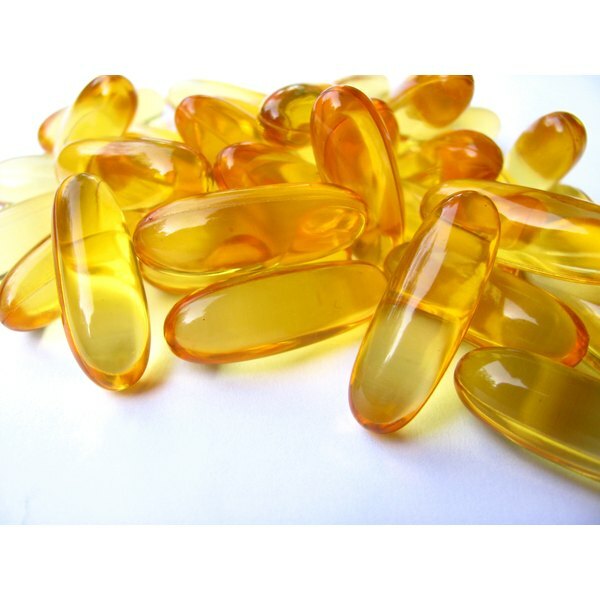 According to MedlinePlus.com, fish oil has demonstrated strong evidence for reducing high blood pressure. The University of Maryland Medical Center also notes this benefit for GLA, particularly when combined with fish oil. These effects however, were produced with high doses of these supplements and you should talk to your doctor before self-treating your blood pressure with fish oil and/or evening primrose oil. Fish oil also gets high marks for reducing triglycerides and the risk of heart disease, according to the review of evidence by MedlinePlus. Even with all of its benefits for the heart, it has not demonstrated a strong ability to influence cholesterol levels. The National Center for Complementary and Alternative Medicine says evening primrose has been used as a treatment for eczema since the 1930s. The University of Maryland Medical Center notes that evidence on whether it actually works has produced mixed results. Evening primrose and other supplements that contain GLA are commonly recommended to promote overall health of the skin, hair and nails. The anti-inflammatory actions of fish oil have also made it a popular treatment for skin conditions but both the UMMC and Mayo Clinic note studies have not produced enough clear-cut information to formally recommend it for these purposes. According to the UMMC, GLA reduced symptoms of diabetic nerve pain in several studies but explains it appears to work better in diabetics with better-controlled blood sugar. Fish oil has been touted as a beneficial supplement for diabetes but the MedlinePlus.com reports that it does not appear to be effective for that condition. Evening primrose also has a long history of use to treat women’s issues such as menopause, PMS symptoms and breast pain attributed to the menstrual cycle. NCCAM explains that many well-designed studies have refuted its effect on PMS. The UMMC says studies looking at its effect on hot flashes have also produced negative findings. Evening primrose is generally safe to take though it might cause side effects like stomach upset, headache and loose stools. The UMMC explains that unless you are taking it therapeutically for a specific health condition, you probably do not need a supplement as you get sufficient omega-6 fatty acids from your diet. Recommended dosages vary depending on the condition but most require several thousand milligrams daily. Avoid evening primrose oil if you have seizure disorders; it has been reported that this supplement induced seizures in people with a predisposition to this condition as well as in people taking this supplement with anesthetics. Possible side effects of fish oil include belching, gas, bloating and diarrhea. Fish oil has blood-thinning properties and you should refrain from using it if you take anti-coagulants like Warfarin or have bleeding disorders. It can also interact with diabetes medications. Do not take more than 3,000 milligrams daily without professional supervision.